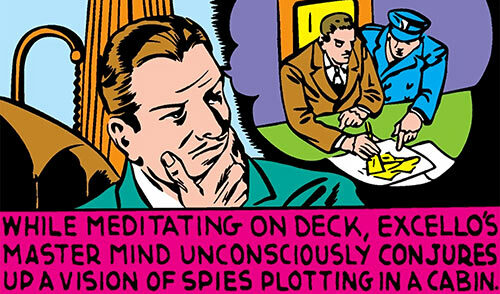 Master Mind (two words) Excello was an obscure Golden Age character. 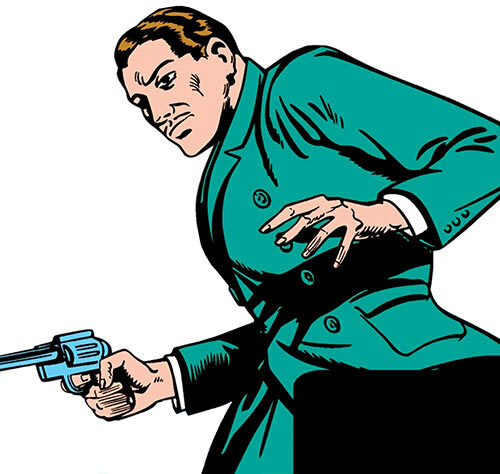 He appeared twice in 1940s in comics by Timely, the ancestor of Marvel Comics. Then he was essentially forgotten. Until Greg Pak brought him back as part of Amadeus Cho’s origin sequence. This profile only covers the 1940 vintage material. Snap steel chains using his bare hands. Lift and throw large turbines weighing about a ton or three. Knock out soldiers with one punch. He also demonstrated incredible agility. Excello once leapt on the back of a passing speeding car without the passengers noticing it, and once leapt from the wing of a low-flying airplane onto a car. Oddly enough, Excello can easily be knocked out by surprise attacks. The good old truncheon to the head from behind works fine, of course. But even a person suddenly punching without him expecting it is likely to KO the Master Mind. On a more intellectual level, seems proficient with an incredible array of skills. The master Mind apparently built his secret gadgets (see the game stats for those) himself, can pilot most if not all vehicles, etc.. He seems to be both a chemist and an electrical engineer, through that is presumably but a part of his skills. “Unconsciously pick up” dangers to America. Witness events taking place in other rooms some distance away (receiving at least the visual and audial input). Inexplicably learning precise data, such as the exact address of the spy leader’s secret base. He also has high-level connections all through the US Navy . Enough to have them unhesitatingly shell whatever he tells them to target over his pocket transmitter. Master Mind Excello once foiled a nefarious plot against America involving foreign saboteurs placing bombs in key water dams. He then proceeded to stop Russian terrorists from blowing up trains. Those dang foreigners ! 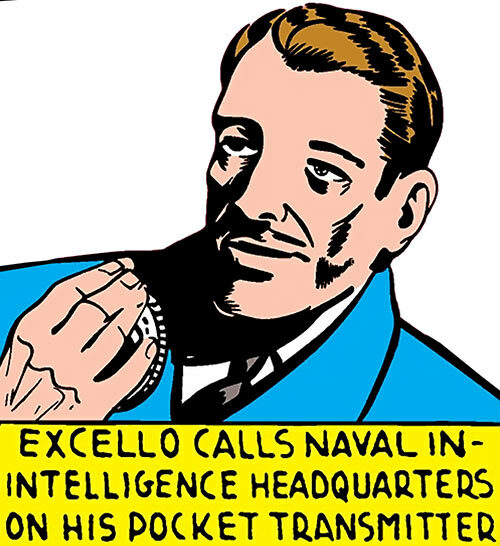 Although Mystic Comics promised that Excello, the Master Mind, would unravel another intriguing plot against the government, he never appeared again. Who can you trust ? The last illustration is Chris Weston’s take for The Twelve, rather than vintage art. So it’s a more modern view of the concept, but still stepped into the 1940s. 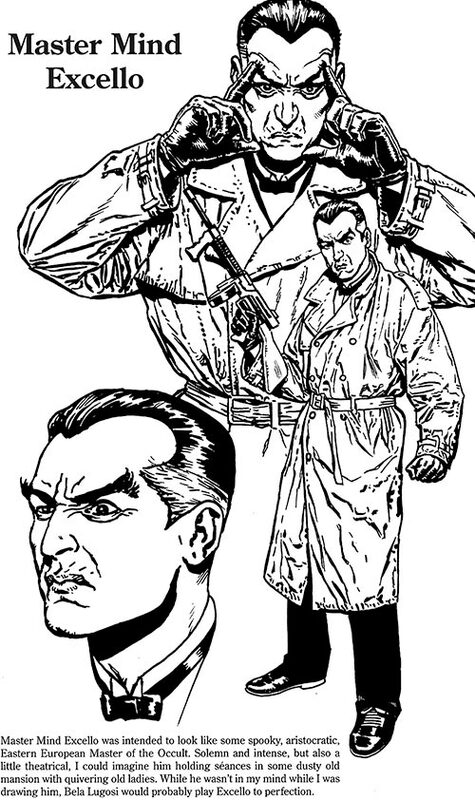 Generic two fisted 1940s science-action hero and spy buster, with no code against killing. He’s very confident. Which makes sense given how he overwhelms the opposition. All Powers presumably are Skilled Powers. Awareness works on a national, rather than cosmic, scale. Adjust OV/RVs accordingly. Awareness is limited to threats against the United States of America. Awareness is Discerning. It can “visualise” such precise data as an exact address and floor of a threat. Remote Sensing only works on threats Excello previously picked through Awareness, or is currently sensing through Awareness. Credentials (US Navy (incl. Naval Intelligence), Medium), Familiarity (Disguises), Headquarters (Expansive – his hidden airport). Attack Vulnerability (-2CS OV and RV against Bashing Blindside Attacks). Triple Propeller Pistol [BODY 05, Projectile weapon: 06, Ammo: 06]. I have no idea what a triple propeller pistol is. But this ordinary-looking 1940s revolver is very powerful. Secret Vacu-Pads [BODY 02, Cling: 02, Miniaturisation: 01]. Suction pads to climb buildings. Pocket transmitter [BODY 02, Radio communications: 08, Miniaturisation: 02]. This transmitter is preset with Naval radio frequencies. Secret Mini-Disguise Kit [BODY 04, Miniaturisation: 02]. SUPER-CHARGED PLANE [STR 06 BODY 09 (Hardened Defences), Flight: 08, Radar sense: 16]. The PLANE is kept at the hidden airport (where else ?). It seemed to be reinforced and armoured as well as supercharged. Omni-Gadget (x2) (ABCD, 8 APs). A demonstrated example was secret chemical SF44 (Acid). Excello also produced a “vial of his secret high explosive” (Bomb). – Senses 10 (Awareness (Threats to America) Extended 5, Penetrates Concealment). – Remote sensing 15 (Visual, audial), Limited (to threats picked up through Awareness). – Enhanced Advantage (Well-Informed) and Enhanced Skill (6 Ranks of Investigation), both Limited 1 to threats against America. Triple-Propeller pistol — Ranged ballistic Damage 5. Secret Vacu-Pads — Movement 1 (Wall-Crawling). Pocket transmitter — Feature 2 (Miniature radio transmitter with preset Naval frequencies). Mini-disguise kit — Feature 1 (Full makeup resources for impersonation). Terribly convenient gadget — Variable 7, Check required (Expertise (Science)). Close Attack 2, Defensive Roll 4, Ranged Attack 4, Seize Initiative, Takedown. Benefit 2 (Wealth), Benefit 1 (Hidden airport base), Connected (US Navy), Equipment 6. Acrobatics 5 (+11), Athletics 4 (+11), Deception 8 (+10), Expertise (Science!) 9 (+14), Expertise (Espionage) 9 (+14), Insight 6 (+10), Perception 8 (+12), Persuasion 3 (+5), Sleight of hand 4 (+12) (Limited 2 to Concealing), Stealth 1 (+7), Technology 9 (+14), Vehicles 4 (+12). 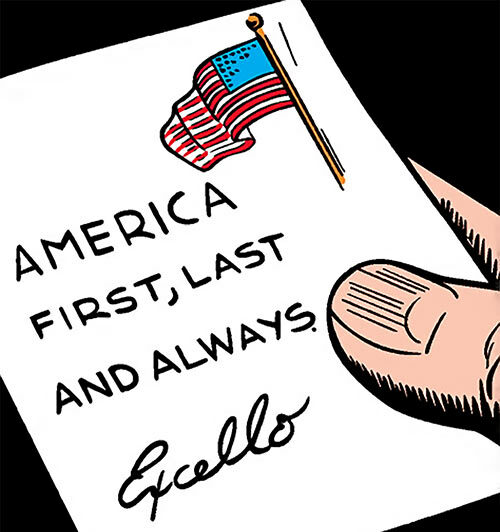 Super-patriot Master Mind Excello lives to protect America. Bushwhacked Attempts at knocking out Excello from behind will almost always suceed. Trade-off areas. Attack/Effect PL 10, Dodge/Toughness PL 10, Parry/Toughness PL 10, Fort/Will PL 10. Points total 255. Abilities 92, Defences 20, Skills 34, Powers 40, Devices 37, Advantages 22. Equiv. PL 17. He’s an invincible, all-knowing wish fulfillment character. Therefore, I statted with a broad brush and highballed attributes so he can win at everything. 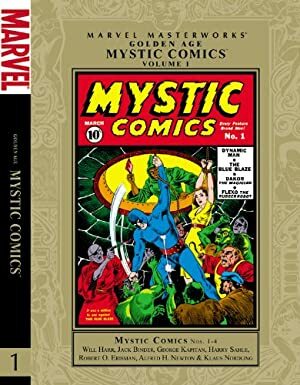 Source of Character: Mystic Comics #2 and #3 (1939).